Air conditioning systems have been witnessing a surge in demand from both commercial and residential applications, with the popularity of smart thermostats and inverter air conditioners rising with increasing adoption. The focus of most manufacturers of air conditioning systems is energy efficiency, given escalating global concerns over energy conservation. Concerns associated with air pollution have also spurred the demand for air purifying technologies, a trend the air conditioning systems market has been capitalizing on. Air conditioning systems are systems that adjust the properties of air, primarily humidity and temperature, to more favorable conditions. There are various types of air conditioning systems available, including windows, portable, splits, single packaged, cassette, airside, and chillers. They find application across industrial, residential, automotive, and commercial sectors. These systems are available in the market through distribution channels, including furniture stores, DIY stores, supermarkets, and company authorized/owned stores. The changing climatic conditions worldwide are creating a staggering volume of demand for air conditioning systems. 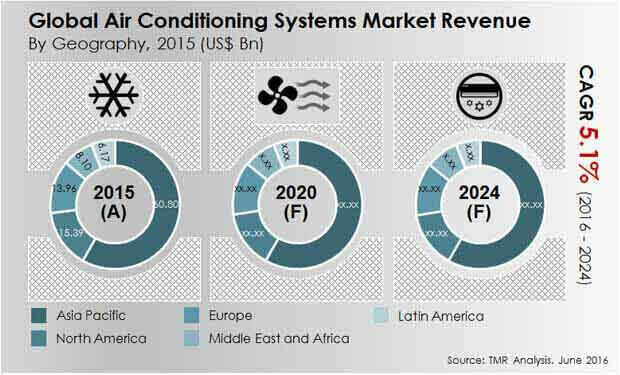 According to Transparency Market Research (TMR), the global air conditioning systems market is poised to reach a valuation of US$167 bn by 2024 from US$104.4 bn in 2015, expanding at a CAGR of 5.1% between 2016 and 2024. The report is a professional study of the market, covering all the important parameters extensively. It presents the statistics pertaining to every segment as well as the overall market in a graphical form in order to provide an immaculate understanding to readers. The rapid expansion in the construction and housing sector worldwide is one of the primary factors supplementing the growth of the global air conditioning systems market. Stringent government regulations pertaining to emissions and technological evolutions are stoking the growth of the market. Moreover, the burgeoning demand from the commercial sector coupled with the rising consumer expectations is providing a fillip to the global market. Consumers are paying higher attention to the indoor quality, which in turn is translating into the greater uptake of advanced air-purifying technologies. On the other hand, air conditioning systems consume greater energy, which limits their widespread adoption. Nevertheless, the emergence of green technologies and energy-efficient systems are likely to address the issue and shape the future of the market. Asia Pacific will continue to dominate the market until 2024, accounting for over 55% of the overall market revenue. The high demand for air conditioning systems in countries such as Japan, China, and India is fuelling the growth of the region. The increasing emphasis on replacing air conditioning systems with energy-efficient equipment is also contributing the growth of the region. North America will also be a prominent market, with the U.S. being at the forefront of growth. The standards set by the American Society of Heating, Refrigerating and Air Conditioning and ongoing technological advancements are escalating the growth of the region. The market in Europe is expected to witness moderate growth, with the EU7 being the major revenue contributors. The rising awareness regarding the benefits offered by energy-efficient air conditioning systems in building automation and control is propelling the growth of the region. The growth of Latin America can be attributed to the growing adoption of smart air conditioning systems. In the Middle East and Africa, countries such as the U.A.E., Turkey, Israel, and Saudi Arabia are the sights of high growth rate. The majority of players in the global air conditioning systems market are focusing towards integrating products in order to expand their customer outreach. Apart from this, strategic partnerships and acquisitions are also looked upon as viable strategies for consolidating the presence. The leading players in the market are Daikin Industries Ltd., Gree Electric Appliances Inc., and Carrier Corporation. Other prominent companies operating in the global air conditioning systems market are Haier Electronics Group Co., Mitsubishi Corporation, Panasonic Corporation, LG Electronics, The Midea Group, Ltd., and Hitachi Ltd.